The first wave of consolidation in the industrial vehicle sector concerned LATIL and SOMUA, who merged with the heavy goods vehicle division of Renault, which had been nationalised in 1945. SAVIEM was the result of the merger. The public authorities encouraged business combinations to counter foreign competition and shoulder heavy investments. 1. 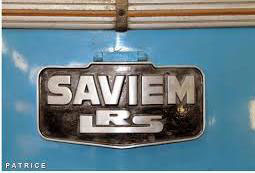 The SAVIEM logo in 1955 and in 1975. The solution was amenable to everyone concerned: LATIL, which was too small to gain a foothold on the heavy goods vehicle market, Schneider, SOMUA’s parent company, who wanted to focus on iron and steel and was looking for partners for its industrial vehicles, and Renault who wanted to give priority to the automotive sector and make its HGV division independent.